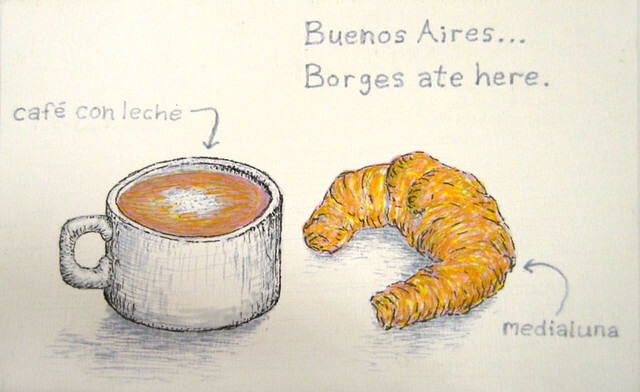 This entry was posted in Food & Drink and tagged argentina, beakfast, buenos aires,, cafe con leche, Cafes, comfort food, croissants, medialuna de manteca, medialunas, recipes by Fierro Hotel Staff. Bookmark the permalink. Thanks for including the recipe! If anyone is interested in ordering medialunas or facturas online to have them delivered to your home, check out sinimanes.com online delivery. I normally love your blog posts but this is truly infuriating. I love to bake and have tried this recipe twice now and both times it has really not worked. Can someone else try and see if its just me or a bad recipe! Hi Sarah, Its pretty difficult to get the medialuna point just right, what was wrong with the ones you made? Here is a youtube video which shows how to make them. The recipe is slightly different but you will be able to see the folding technique clearly, which is essential to get the texture right. http://www.youtube.com/watch?v=XEluWWmNMys. Best of luck! It was the quantities of the flour and butter that I was having difficulties with, it just seemed to be a thick dough and not a great taste to it. It is probably me but I would love to know how to make medialunas and I try out almost all of the blog suggestions so I would love to get this one right as well!!! We made a mistake on the first step, it said place ¾ of pastry flour when it should have said 3/4 cup of pastry flour. (it´s been corrected). Also, some medialuna recipes also include a bit of vanilla extract and lemmon rind for flavor. Keep in mind that the dough needs a lot of kneading in steps 4-6. Check the video we recommended as well (http://www.youtube.com/watch?v=XEluWWmNMys) so that you can see what the dough´s texture should be like and the folding technique (a key to the fluffiness of the medialuna). Hopefully you will get the results you´re looking for, however it is a difficult pastry to make so it may take some practice! Best of luck!! Ah that makes a lot of sense now, thank you. Please keep the suggestions coming, love reading the emails and blog and recommend it to all my friends.